UPDATED: Dates and times of the games have been edited from the original post after Saturday's postponement due to rain. After 220 total games in just over seven weeks, the Cape League regular season has concluded and the postseason has arrived. The Chatham Anglers (22-19-3) earned their spot in the playoffs with six games to spare and clinched the two-seed three contests later. The A’s will face off against the Harwich Mariners (18-24-2) in Game 1 of the East Division semifinals Sunday night at Veterans Field as they begin their quest for their first Cape League title in 20 years. 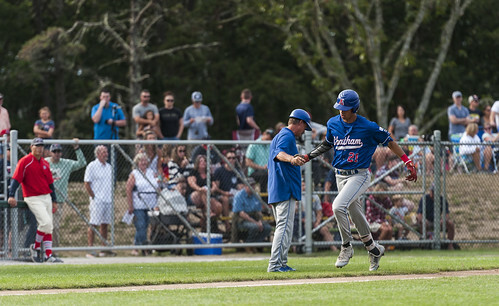 Unlike last summer, Chatham will look to start the postseason on a positive note. In 2017, the Anglers fell in Game 1 of the East Division semifinals to the Orleans Firebirds, 7-2. The last time the A’s advanced to the East Division finals came in 2016 over the Mariners in the first round. Austin Bergner (North Carolina) will take the bump for the Anglers on Sunday night. The second-year Chatham player was the starting pitcher in the A’s sole postseason win last summer, a 3-1 win over the Orleans Firebirds at Veterans Field in Game 2 of the East Division semifinals. In 2018, Bergner has been one of the Anglers’ best hurlers. The right-hander has made four starts, lasting five innings or longer in each of them. Bergner has registered 26 strikeouts and seven walks in 22.1 total frames. His most recent start, a July 27 matchup at Y-D, marked his only scoreless outing of the summer. Ricky DeVito (Seton Hall) will make his ninth appearance and sixth start of the summer in Game 1 The right-hander has conceded an earned run in just three of his eight outings on the summer. DeVito’s worst start of the season came against Chatham at Veterans Field on July 7. He lasted 3.2 innings and surrendered six runs on six hits while walking three. The Anglers swept the six-game season series against the Mariners, winning each game by three runs or more. Chatham’s 13-6 win at Whitehouse Field on July 3 marked the second-highest single-game run total the Anglers achieved all season. In total, the A’s outscored the Mariners 34-20. Blake Sabol (Southern California) and Greg Jones (UNC Wilmington) have done the most damage against Harwich. The two Chatham players have each hit above .400 and combined for 16 hits, 11 runs scored and nine RBIs in games against Harwich this season. Cape League All-Star selection Andre Lipcius (Tennessee) has been the Mariners’ top performer against the A’s this season. Despite batting .238, Lipcius has two homers, five RBIs and five runs scored in six games versus Chatham. The Mariners come into Sunday’s game having lost four of their last five. During that span, it was Harwich’s pitching staff that caused the losing skid. In 43 innings, Mariners pitchers conceded 48 hits and 32 earned runs. Of the 15 pitchers Harwich manager Steve Englert used in the final five games of the regular season, 11 allowed at least one run. DeVito, the starting pitcher in Game 1 against Chatham, has not thrown since July 27. As a team, the Mariners are batting .250 over the last five games. Lipcius, Tanner Morris (Virginia) and Danny Casals (Maine) have each tallied at least five hits and a homer in that span. Eight of Harwich’s 22 runs in its last five contests were piled into its 11-8 loss against Brewster.